Approx 41cm or 16 inch square 100% cotton cushion cover in your choice of royal blue or black colour. Enter the name you want to be custom embroidered in this Jedi style font. 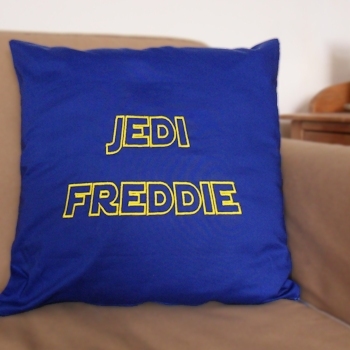 Enter the name you want to be custom embroidered in this Jedi style font. Beautifully sewn in a thread colour of your choice to make a fantastic Personalised cushion. This personalised cushion is a wonderful keepsake gift to commemorate a birthday, anniversary, housewarming gift or holiday!